New York: Ariel Books, 1962. 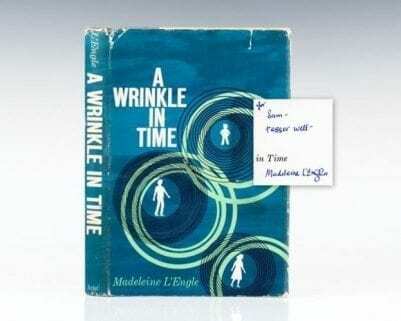 First edition of L’Engle’s Newbery award-winning novel. Octavo, original half blue cloth. Inscribed by the author on the title page, “For Sam, Tesser Well Madeleine L’Engle.” Light wear to the bottom boards, near fine in a very near fine first issue dust jacket that shows some light wear and a closed tear to the front panel. Without the Newbery Award-winning seal to the front panel. Jacket design by Ellen Raskin. Housed in a custom half morocco clamshell box. A very sharp example.